Ribbon wands, also called wind wands, are one of our favorite new DIY play materials. They encourage movement and imaginative play, which are crucial to early childhood development. And boy, are they fun! Who doesn’t want to twirl with one of these and watch the ribbons flutter around? Best of all, they are both cheap and easy to make. Follow these simple steps below to make your own ribbon wands at home! -Wooden rings. We used these. -Ribbons. It’s fun to have three to five different colors on each. 1) Cut your ribbons to the desired length. We will be folding them in half, so cut them to be twice as long as you’d like the ribbons to hang. Ours are long, about two yards each. 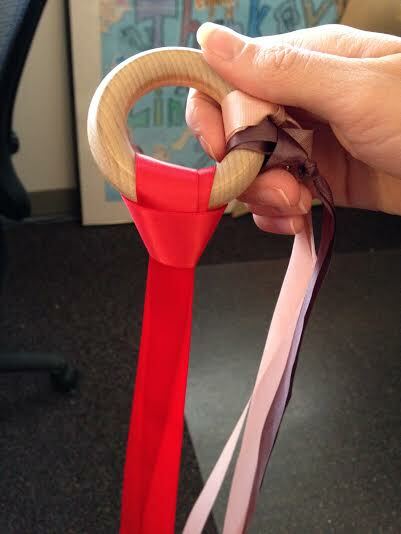 2) Fold a ribbon in half and loop it through the ring, folded side first. 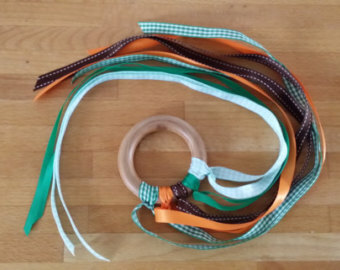 Tuck the unlooped side of the ribbon through the loop and pull to smooth and straighten. 3) (optional) Tie a knot below the loop to further secure the ribbon. 4) Repeat steps two and three for the rest of your ribbons. 5) Play, twirl, and enjoy!